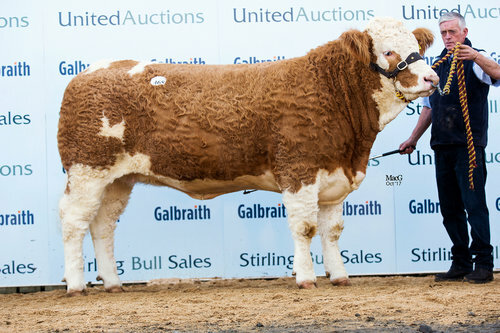 The Dispersal of the Sterling Herd of Boddington Estates Ltd smashed the Female Breed Record with Sterling Barcardi’s Hawaii, an Annick Exocet daughter out of a Sterling Flint daughter sold for a staggering 28,000gns to Messrs Barker & Borlase of Sacombe Hill Farm, Watton on Stone. 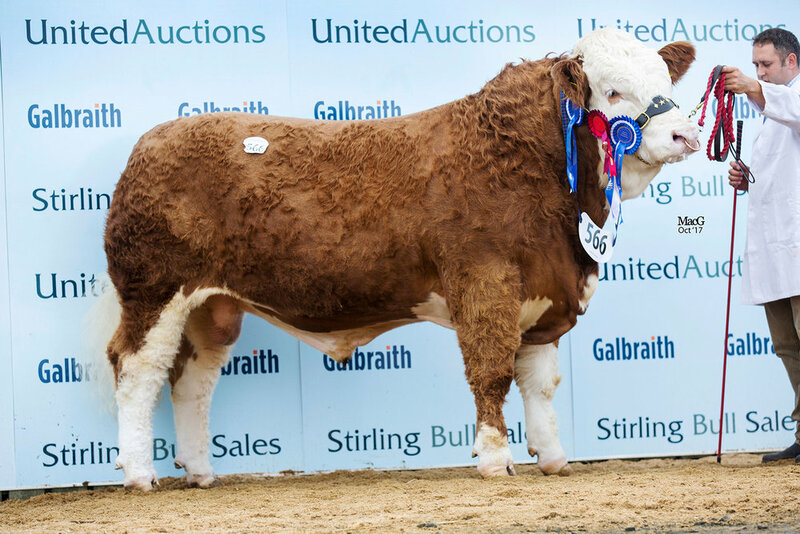 The Sterling herd also secured the Second Female Breed Record with Sterling Celia’s Fifi and her heifer calf, selling for 22,000gns to Harte Peat Ltd, Leonards Island, Clones, Co Monaghan. Overall, 13 cows and calves averaged at £5605, 25 in-calf heifers averaged at £2375, 14 in calf heifers averaged at £3135, 17 maiden heifers averaged at £4101 and the 14 young bulls averaged at £1560. Topping trade on the day at 22,000gns was Manor Park Hansome, bred by Mr D C Houldey, Kirtleton House, Waterbeck, Lockerbie, DG11 3HD. A Slievenagh Extra Special 13 son out of a Blackfrod Worzel 2 daughter. Purchased by G Behan, Cloneygowan, Portlaois, Eire. Second top price on the day, out of the same stable was the Overall and Intermediate Champion Manor Park Hayden, bred by Mr D C Houldey, Kirtleton House, Waterbeck, Lockerbie, DG11 3HD. A Blackford Worzel 2 son out of an Ashland Perfect daughter, selling for 18,000gns to A Wright, West Lundie, Doune. Next, selling for 15,000gns was Islavale Hogan, bred by Mr W S Stronach, Berryleys Farm, Grange, Keith, Banffshire, AB55 6LN. A son of Wolfstar Elusive 13, out of a Clonagh A Super Star daughter. Purchased by K Eunson, Braebuster, Deerness. Following on at 13,000gns was the Reserve Overall and Reserve Intermediate Champion Rockytop Hurricane, bred by Gary & Angela Christie, Birchfield, Glass, Huntly, Aberdeenshire, AB54 4XS. A son of Corskie Cannon, out of a Brinkton Major daughter. Purchased by W J Hollingsworth, Midhope Hall Farm, Sheffield. 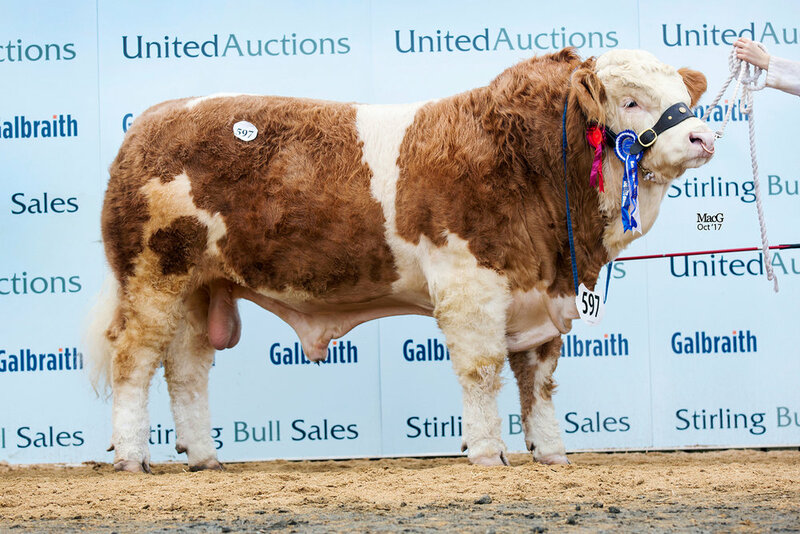 Two bulls then traded at 11,000gns, the first being Aultmore Hamlet, bred by W M Patterson & Son, Upper Forgie, Aultmore, Keith, Moray, AB55 6QT. A Banwy Bonzo son, out of a Whitemire King Kong daughter, sold to J Innes & Son, Dunscroft, Huntly. 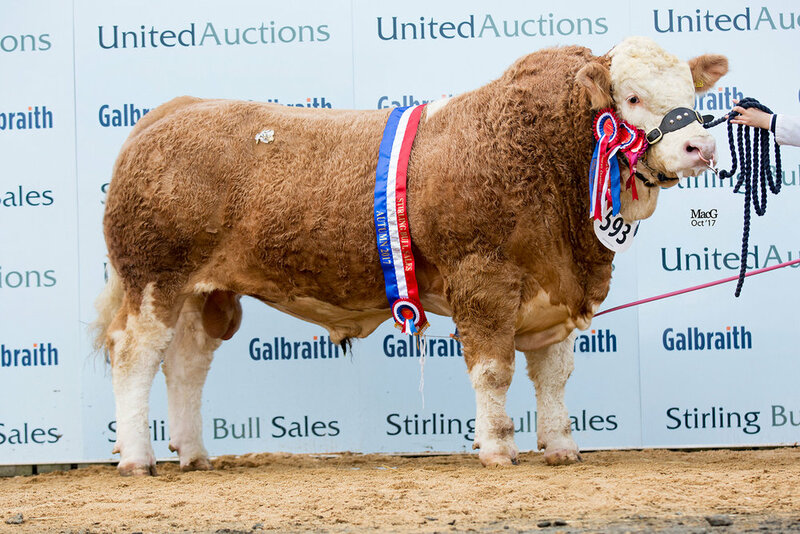 Next at 11,000gns was Strathisla Hagrid, bred by, Mr A Ivory, Strathisla Farms, Moolies, Meigle, Blairgowrie, Perthshire, PH12 8RF. This Islavale Donald son, out of a Omorga Samson daughter sold to J Jeffrey, Kersknowe, Kelso. Innerwick Hotshot, bred by Mr & Mrs L Moffat, Innerwick Farm, Innerwick, Dunbar, East Lothian EH42 1SE. A son of Braidwood Everest, out of a Strathisla Kaiser daughter sold for 10,000gns to JI & WN Stout, Whitehall, Stronsay, Orkney. Two bulls then traded for 9000gns, Kilbride Farm Holestone bred by W H Robson & Sons, 106 Cogry Road, Doagh, Ballyclare, County Antrim, N Ireland BT39 0PX. A son of Sneumgaard Imperator, out of a Seaview Prince daughter sold to A & J Craig, Craigton, Castle Douglas. Next at 9000gns was the Reserve Junior Champion Corskie Harbro, bred by Mr WJ & J Green, Corskie, Garmouth, Fochabers, Moray, IV32 7NN. A Dirnanean Bradley son, out of a Islavale Sabre daughter, purchased by A D Sutherland, Connachie, Elgin. The 61 bulls sold through the ring averaged at £5720, up by £337 on the year. 14 Bulls sold after the sale and 14 bulls were sold at the Sterling dispersal. In total we sold 89 bulls on the day which is the most sold across all the other breeds. Female Champion Williams Belle’s Hannah, bred by Mrs H Clarke, William Clarke Livestock Ltd, Model Farm, Brick Kiln Road, Hevingham, Norwich, Norfolk NR10 5NL. A daughter of Clonagh Diehard Gallant, out of a Heathbrow Mischief daughter, sold for 3500gns to Harte Peat Ltd, Leonards Island, Co Monaghan.